On Monday night against the New Orleans Pelicans, Luka Doncic put up 26 points, 13 rebounds and 10 assists. This would be a great stat line for any player in the NBA, but it's particularly stunning for a rookie still learning the ropes. Doncic is no ordinary rookie. The Dallas Mavericks have the best rookie in a long time, and here are three stats that prove it. Stat No. 1: Let's start with the fundamentals. Doncic is on pace to be the first rookie since Michael Jordan to average at least 21 points, 6 rebounds and 5 assists. The only guy to do that before MJ was some fella named Oscar Robertson. Is that good company for the 20-year-old Slovenian? Doncic's scoring is great by itself. His 21.1 PPG would be the most for any first-year player since Blake Griffin averaged 22.5 in 2010-11. But Griffin played 38 minutes per game that season and was older than 21 when he made his NBA debut. Doncic was 19 until three weeks ago, and he plays only 32 MPG. No teenager has ever come into the league and accomplished as much in one season as Doncic. Not only is he clearly the Rookie of the Year, you could make a case that he's the best rookie of the decade. When you look holistically at age, usage, efficiency and scoring, Doncic's season is among the best by any rookie in a long time. Of all those players, nobody suited up in the NBA at a younger age than Doncic. Irving would've counted, but his debut was postponed by the 2011 lockout. Regardless, any serious statistical study of rookies has to control for age -- a major factor in statistical draft projections, such as those from ESPN's Kevin Pelton -- and Doncic is a pup by NBA standards, which makes what he's doing even more impressive. There aren't many teal dots indicating teenagers in the top range. The only players that young to cross the 20 PPG threshold are Doncic, Kevin Durant, Carmelo Anthony and LeBron James. That's pretty good company, but it's even scarier to consider that, of that foursome, Doncic is on pace to log the most efficient scoring season. Stat No. 2: Doncic is on pace to become only the second rookie in NBA history with a usage rate of more than 30 percent. Ben Gordon is the only other guy to do it, and -- at the risk of sounding like a broken record -- Gordon was well past 21 when his season started. MJ nearly did it with a 29.8 percent usage rate in 1984-85 (also over age 21), but Doncic just turned 20 and it's fair to assume all his key stats will improve by the time he can buy a margarita at Chili's. Doncic's sky-high usage demonstrates just how central he is to the Dallas offense. Over the past 15 games, only James Harden and D'Angelo Russell finished a greater share of offensive plays. That chart has some blue on it, which suggests Doncic isn't efficient yet, but few rookies are. 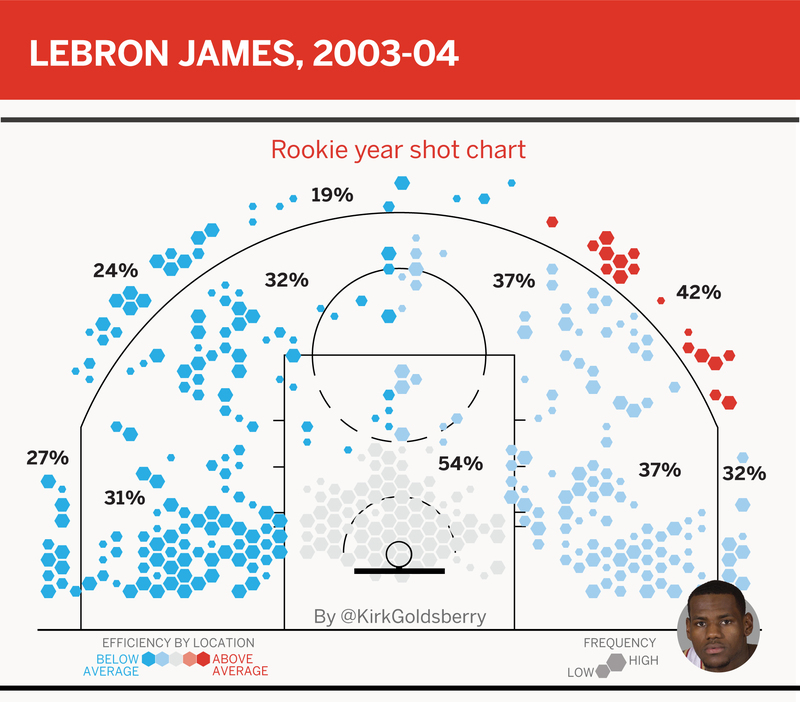 During his rookie season, LeBron logged a putrid 48.8 true shooting percentage (TS%) and his rookie season shot chart is a clear reminder that even the best NBA careers often get off to awkward starts. Doncic's TS% is already at 54.7 -- just under the NBA average, but totally fine when you account for his youth and that insane usage. He takes tough shots, but his shot selection is already aligned with the trends of the day. It's more Harden than it is Allen Iverson, which will only help accelerate increases in his efficiency markers. Stat No. 3: Doncic has already set the NBA record for unassisted 3s by a rookie. It's not just that Doncic is a phenom, it's that he's a phenom whose game skews toward where basketball is going. He's poised to become the league's best Harden impersonator. Lots of high ball screens, matchup hunting, isolations at the top of the arc and dribbling sequences that end with one of four outcomes: step-backs, driving rim attacks, free throws or terrifying kick-outs. It's Harden-ball. Doncic is already a wonderful shot creator. So far this season, 48 different passers have created at least 500 shots for teammates, but only three of them are creating looks of this quality, according to Second Spectrum tracking. On average, Doncic's passes to shooters result in shots with an expected effective field goal percentage of 58.3. Only Harden, Ricky Rubio and Doncic's chief competitor in the Rookie of the Year race, Trae Young, have generated better opportunities. And speaking of Young, the Traetheists making the case that he's the ROY have to assign ridiculous weight to assist numbers, because that's the only category in which he's beating Doncic. Despite his absurd shooting lately, Young still ranks No. 437 in ESPN's real plus-minus largely due to his league-worst mark defensively. Doncic is No. 82 overall. With Doncic on board, the future in Dallas is bright. The acquisition of Kristaps Porzingis immediately gave the Mavs one of the most intriguing young duos in the NBA. Porzingis can both pressure the rim and stretch the floor. At least on paper, he provides an optimal pick-and-roll partner for Doncic. 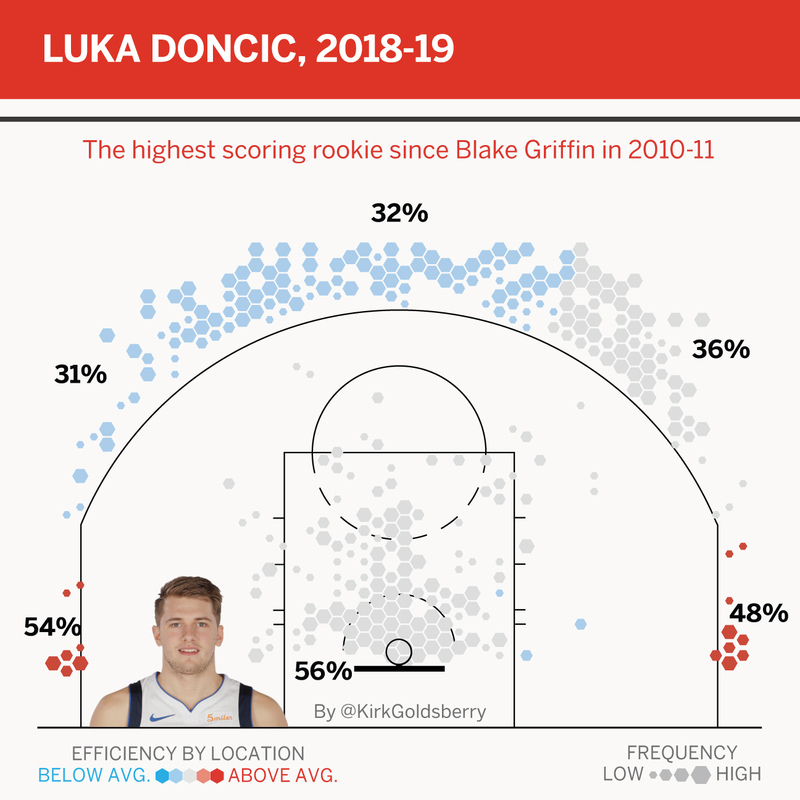 Pairing Doncic's feel for the game, passing and versatile scoring with a big man who has Swiss Army-knife skills of his own is a dream -- and a way to truly unlock Luka's playmaking potential. Consider this: Doncic's teammates have been shooting 1.9 percentage points worse than expected on those assist opportunities he keeps creating, which is the fifth-worst difference among that group of 48 passers after accounting for shot quality, per Second Spectrum. As if the Doncic-Porzingis pairing isn't exciting enough for the Dallas, consider this: The team might still add another young star in the 2019 draft. The Mavs have lost nine of their past 10 games, racing to the bottom of the league's standings. That's important because they have to send their first-rounder to the Atlanta Hawks unless the pick lands in the top five. ESPN's Basketball Power Index (BPI) now gives Dallas a 31.6 percent chance of keeping its pick -- a real possibility of creating the NBA's newest and youngest big three. Regardless of Dallas' upcoming lottery luck, Doncic looks to be one of the best draft picks in recent years. Not only is he primed to be a superstar, his game is perfectly molded for the future of the NBA. If Harden is a harbinger of future hoops, then Doncic is built for that future, and so are the Mavericks.